Whilst on holiday on Mull there are plenty of animals to keep wildlife enthusiasts entertained. Whether it’s pottering about in rock pools on the beach, to watching otters, seals, eagles and even the odd basking shark or whale, Mull really does have an impressive range of creatures on the doorstep. An Otter potters about on the Mull shoreline. Along the shore-line below Beach House there are at least two families of Otters. 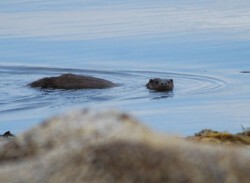 Whilst naturally evasive of people, an early or late in the day visit to the nearby stone road-bridge, armed with a pair of binoculars, often allows you to catch glimpses of the Otters working the seaweed beds to catch food. With a long, slim body and small yet powerful jaws, otters are perfectly adapted to a life living between the shoreline, the shallow coastal waters and the land. They’re equally at home in fresh and salt water. Otters have webbed paws and a very thick and muscular tail which they can use to give them an impressive turn of speed under the water. An Otter’s ears are close to the head and quite difficult to spot and they can actually close both their ears and nostrils when swimming under the water. The dark brown fur is vital to their survival success and is actually two types in one: stiff waterproof guard hairs and a a more dense and much finer fur beneath which gives Otters excellent insulation. They can use their whiskers as a form underwater picking up the movement and vibrations of a potential snack. Food-wise Otters are fish-eaters but they are promiscuous feeders and will happily go off-menu for shellfish, crabs sea birds, frogs and small rodents. 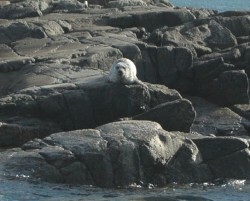 A seal basks on the rocks near Iona. Both east and west you can often spot seal colonies basking on small rocky outcrops just away from the shore. These creatures, whilst wild, are really surprisingly tame and will happily allow you to get very close to them in a boat. If line fishing near rocks where they bask, be careful not to snag one stealing your catch. The common seal is a bit of a misnomer as it’s actually the Grey seal which is in much greater numbers around Scotland. About 90 percent of common seal are in Scottish waters. An adult common seal will range in size from 1.5 to 2 metres long with the male or bull weighing in at as much as 250 kilos. Females, or cows, are typically half that size. Both males and females have dark grey backs and a lighter, speckled underbelly. Common seals are quite happy using the many rocky outcrops dotted around Mull’s coastline. They fish over big areas, eating on anything from shrimps and other small crustacea to herring. Breeding is typically between June and July. Grey seals can grow slightly bigger than the common. Typically a male will be two metres in length and weight in at 300 kilos. A grown female will be around a third lighter at 200 kilos. Bulls carry a larger muzzle and a more pronounced snout or ‘Roman nose’. Fur colour can range from a dark brown to grey with lighter speckling or spots. Typically the females are lighter than the males. Grey seals love Scotland’s rocky west coastline, so whilst holidaying you’ve a very good chance of spotting this species. They feed on broad range of seafish, crabs, and squid. Breeding is mainly around the autumn. From a distance it’s hard to tell but if you’re lucky enough to see a Golden eagle soaring above you, it’s actually a huge bird of prey. They like to glide on thermals caused by the steep-sided hills and valleys on Mull, holding their wings in a shallow ‘V’ shape. Near the Carsaig Arches on the south side of the island, there are two pairs of golden eagles and they have sometimes been seen coming over to the north shore at Beach House, soaring high above. A pair of sea eagles have recently moved to the Ross of Mull and, if you’re lucky, you may catch a glimpse of this impressive looking creature. 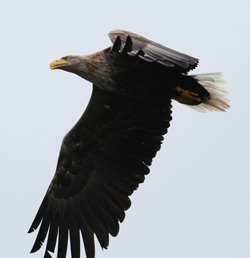 The Sea Eagle, also known as the white-tailed eagle, has been helped by changes in legislation to protect the birds supported by a reintroduction scheme. The Sea Eagle is the world’s fourth largest, with a wings which reach eight feet across. By 1918 they were gone. Laws introduced in the 1950’s helped make it possible to reintroduce the species into Scotland. Perhaps the best known was the island of Rum where 82 Norwegian Sea Eagles were released in the 70s. 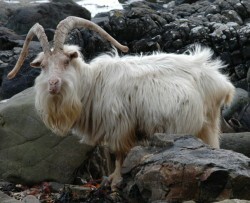 A wild goat on the shoreline at Carsaig on the south shores of Mull. Whilst superbly camouflaged Mulls Red Deer are never far. At Beach House they often come down from the hills to graze around the deer fence surrounding the farmhouse. The moors to the south hold red deer and at the right time of year you may see the males fighting for supremacy and the ability to breed with the does. Directly to the southm over at Carsaig on the south shores there is also a herd of around 70 wild goats, exclusive to this part of the island. You can find out more about all the species in Scotland at Visit Scotland. Wildlife in Scotland: Species.